Asom Jatiyatabadi Yuva Chatra Parishad (AJYCP), Dhemaji district unit has launched a series of agitation programmes against the Citizenship (Amendment) Bill 2016 and demanding introduction Inner Line Permit (ILP) and dual citizenship in the state. The youths’ organization on Monday launched its ‘Mass Signature Campaign’ at Jonai town in support of their demands. It has blocked National Highway-15 at Jonai on Wednesday to press for the demands and demanding withdrawal of the contentious Citizenship Bill. 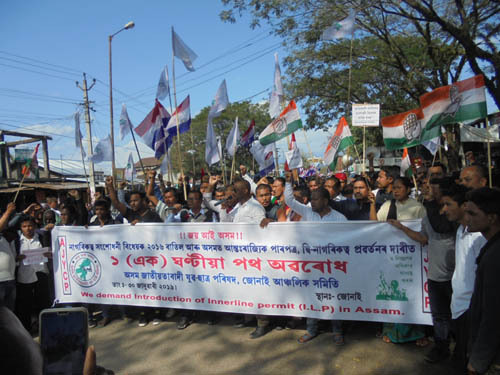 The blockade was supported by Jonai block Congress Committee, Asom Gana Parishad and other local organizations. The organization also announced to resort rail blockade at different portions along Rangiya-Murkongselek BG railway in Dhemaji district on February 7. Addressing the gathering on the blockade spot at Jonai today, AJYCP central executive member Ratul Borgohain said the AJYCP has been agitating for introduction of Inner Line Permit (ILP) and dual citizenship in Assam for the last 40 years, but successive state governments are ignoring the genuine demand. “The prevailing situation in the state has made our demands more relevant,” Borgohain said. Among others, AJYCP Dhemaji district president (i/c) Pulen Das, adviser Rajani Handique, retired principal Dr Sukhlata Gogoi, retired DSP (Police) Suraj Doley and senior citizen Girish Sarma spoke in support of the students’ agitation, opined that the indigenous Assamese communities are in a state of danger on the wake of controversial citizenship bill. The Dhemaji District Committee of the AJYCP following its central committee’s instruction organized a seminar on ‘Introduction of Inner Line Permit (ILP) in Assam’ at Dhemaji during August last year. It also staged sit-in demonstrations in front of the administrative offices demanding Inner Line Permit (ILP) in the State. The AJYCP functionaries, who took serious note on the reported inferior quality RCC works of Central School at Laimekuri (Jonai), submitted complaint petition to Dhemaji Deputy Commissioner on January 23 last, demanded magisterial probe into the alleged irregularities in the building construction. On the other hand, Jonai Block Congress Committee staged ‘Human-chain’ and Sub-division unit Karmachari Parishad staged dharna in front of Jonai SDO’s office on Wednesday demanding immediate scrapping of citizenship (amendment) bill-2016.